This is a first! You are looking at the MRI of my neck. The circled area shows where there is narrowing. The light gray is spinal fluid in the darker gray in the middle is my spinal cord. It’s clear my spinal cord is being compressed. In a few hours I have my appointment with the neurosurgeon. I decided to write this post serially give you some sense of how I am feeling and reacting to this medical situation. I’m not particularly worried about a bad outcome from the surgery. Perhaps I should be. Certainly, based on my reading, there are significant surgical risks. It’s true that the operation I think I will need has become routine and safe. Still, messing around with my spinal cord does not sound like a particularly good thing to do. Based on my experience to date, if I don’t do anything I can expect new and worse consequences. According to the MRI, there is extra bone inside my cervical (neck) spine. This doesn’t appear to be the result of trauma. But who knows? In any case over the last few months symptoms have been developing. I’ve been doing research on my condition. My symptoms are actually pretty typical for this problem. The MRI results rule out non-surgical treatment. Interestingly, none of the articles I found discuss whether the symptoms disappear after the operation. This will be a big topic in my discussion with the surgeon later today. According to my research, the surgery will remove tissue and bone to give my spinal cord more space. 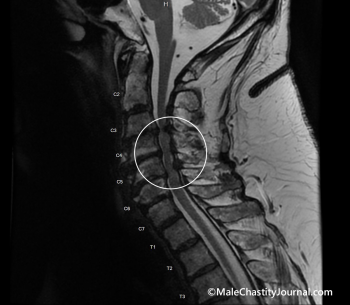 The MRI revealed that there is some scarring on my spinal cord. I’ve been trying to see how I can live with my current situation. Most difficult for me, is the loss of sensation in my fingertips. It makes it nearly impossible for me to button my shirt. Typing has become extremely inaccurate. That’s why I’m using voice dictation software to do most of my writing. No matter how careful I am, the software makes some very silly mistakes. Mrs. Lion attempts to correct these typos but frequently misses some. I go back and correct what I can find. However, she’s better at this than I am. So you may have noticed some odd sentences here and there. I apologize. I’m lucky in one sense. The glaucoma was diagnosed within a few weeks of its arrival. I wear contacts. Last summer the contact solution I use, Clear Care, added something to their product. Prior to this it was pure hydrogen peroxide solution. The new chemical caused me to have a problem. I went to my optometrist who diagnosed a rash on my cornea and prescribed eyedrops. As part of his follow-up, he measured my eye pressure. It was seriously elevated. It had been measured only a couple of months earlier as part of routine exam. So, it was easy to pinpoint when the glaucoma began. I immediately went on treatments and got it under control in a month or two. During the short time my eye pressure was high, there was thinning of my optic nerves in both eyes. It was worse in my left eye. I lost most of my peripheral vision in that eye. There was less thinning in my right eye and no serious vision changes. Once the pressure got under control, vision in my left eye improved in both optic nerves are thicker. This is very unusual. Generally, nerve damage by glaucoma is irreversible. My ophthalmologist theorizes that because we caught it immediately and corrected the issue, the optic nerves were compressed but not destroyed. Glaucoma is the second leading cause of blindness, by the way. I don’t want to make this an organ recital. I just thought you might be interested in how I got to the point that I visited first my doctor and then neurologist. I suppose this sort of problem is due to the fact that we were never designed to live past 40. As far as nature is concerned, once we reproduce we become superfluous. It seems unlikely that the surgeon will promise remission of the problems I already have. I can live with that. The real concern for me at least, is that things will just get worse. According to my reading, loss of capabilities in the extremities are the most common symptoms of spinal cord compression. That means if I don’t do anything, I can look forward to losing more use of my legs. That’s no good. I’d make a truly horrid invalid. I know that I have a good imagination. But, for some reason my thoughts are not straying in the direction of spinal damage. Right now, I’m thinking that my worst case scenario is a lot of pain and frustration while I recover. I know Mrs. Lion is concerned about problems that will be permanent. She’s more of a pessimist than I am. (Much Later) Mrs. Lion and I went to see the surgeon this afternoon. After some rather annoying, wasted time with his physician’s assistant, we got to talk to the Man himself. It turns out he’s a really nice guy. 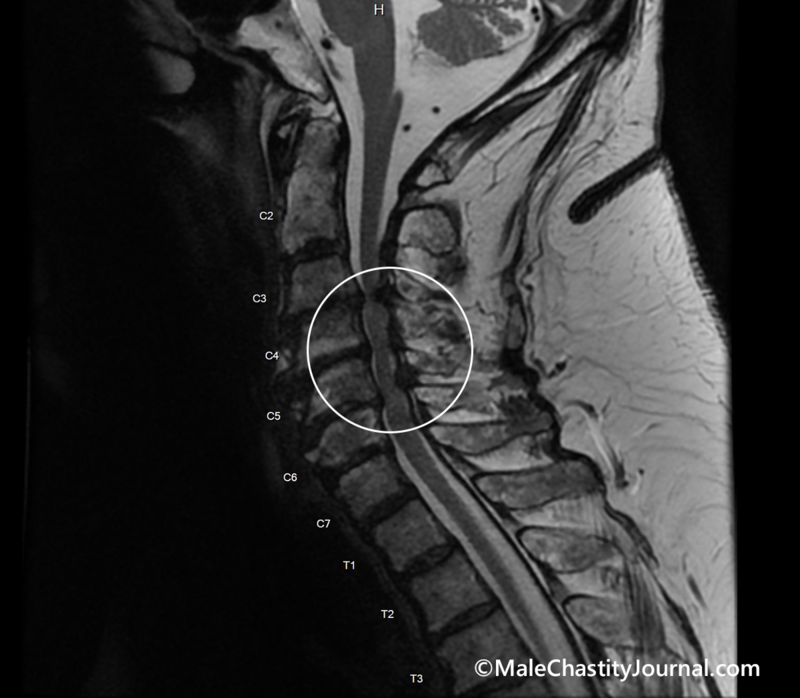 He’s very knowledgeable and when we reviewed the MRI (one view is on the top of this post), it was clear that my spinal cord is being pinched in several places. It’s a serious situation. I absolutely need surgery. The operation involves cutting approximately 8 inches into my neck (nice vertical scar on the back of my neck) and modifying four vertebrae to make more room for my spinal cord. Very fortunately, I don’t need to wear a brace at all. I might want to wear a cervical collar to minimize muscle pain. That seems to be the main drawback in terms of pain. The muscles in my neck have to be moved aside, possibly cut in order to gain access to my spine. Disturbing those muscles creates quite a bit of pain for three or four weeks. There are risks. The major one is that one of my arms might be partially paralyzed for several months. This is called C5 palsy. There’s a nerve that exits at the C5 opening. Even if it’s untouched during the surgery, reducing tension on it as the spinal cord has a chance to expand into its new wider space, can change the tension that nerve is under. No one knows why but in about one third of the cases any change at all can cause several muscles in one arm to not work for a while. I sincerely hope that doesn’t happen to me. We are planning on doing the surgery in the first or second week of March. This gives me a little time to complete some work I have to do. Surgery takes 2 to 3 hours and I will be hospitalized for about three days. Needless to say, neither of us are very happy about all this. I asked how often this hospital does this particular procedure and I was told about once a month. Most cases are ineligible for this particular solution. It’s very good news in terms of the fact that I will retain full mobility of my neck. Half jokingly I asked the physician’s assistant if I can get a copy of the MRI. He replied, “Sure. Just go to radiology and request a CD.” Wow! Really? Yup. I had to go to radiology anyway because the surgeon wanted x-rays to go along with the MRI. I asked the radiology receptionist for a copy of my MRI. She had me fill out a form requesting it and by the time we finished my neck x-rays I was handed a nice little souvenir hospital package that contained a CD and a copy of the radiologist’s report. How about that! I asked Mrs. Lion if she thought I could get an MRI when all this is done. Wouldn’t it be cool to have before and after images? She thought my insurance company might object. We’ll see. Meanwhile, I’m a lot calmer. My rotator cuff surgery left me in considerable pain for nearly 3 months. This surgery is going to be painful for merely one month. The surgeon said that once completed, after a little while for healing, the symptoms that have been plaguing me should subside. That’s cool! So, Mrs. Lion and I will proceed normally until I have to go under the knife. We may have a blackout for a week or two while I am in the initial phases of healing. But rest assured we’ll keep you posted. The prognosis sounds good. I wish you both the best results that are possible. Hang in there, Mr. and Mrs. Lion. It appears that you are in good hands. Any post-surgery discomfort – including the C5 palsy if it happens – will be temporary. The bonus is that you will likely regain feeling where it is now absent. Be patient and positive about this. It won’t happen quickly. Nerves aren’t anything like muscles – they take their own sweet time adjusting to new circumstances. It is difficult to imagine a prognosis more filled with positive expectations. Let us know how you are doing as you are able. We’re thinking about you both.